The Trinidad Moruga Scorpion, the hottest pepper in the world, averages around 1.2 million Scoville units, the scale that measures a pepper's spiciness. Compare that to 5,000 Scoville units for the average jalapeno, and you'll see why the Moruga Scorpion is reserved for the most seasoned pepper aficionados. While you might not want to brave the hottest pepper in the world, capsaicin, the chemical responsible for hot peppers' spicy kicks, can be beneficial outside of making sure your famous salsa is a force not to be reckoned with. Prostate cancer is the most common cancer in men in the United States with more than 230,000 new cases reported each year, according to "Cancer Research." Capsaicin can be a helpful component of a prostate cancer treatment plan because the substance is able to kill prostate cancer cells, according to the American Association for Cancer Research. Capsaicin may also help reduce the expression of proteins that control growth genes that cause malignant cells to grow. 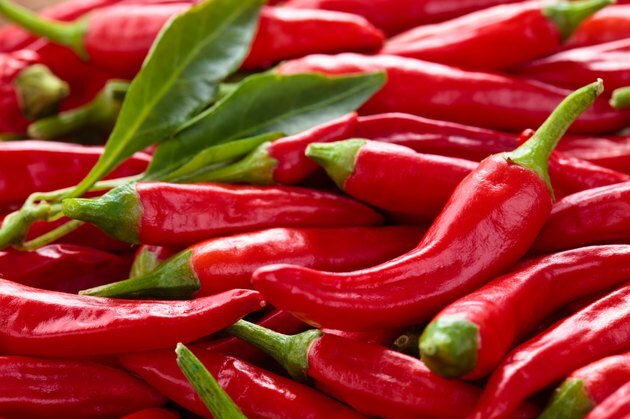 Human studies are limited, but capsaicin has shown promising results in rodent tests. Capsaicin can be used topically and ingested. Topical ointments and creams containing capsaicin are helpful in relieving pain from many different conditions, including arthritis, fibromyalgia, nerve pain and lower back pain, explains the University of Maryland Medical Center. While capsaicin is not a cure for pain caused by these conditions, it does lower the amount of substance P, a chemical that helps transmit pain signals to the brain, when applied directly to the skin. Some studies have suggested that capsaicin may help suppress your appetite, leading to weight loss. There isn't a proven link between capsaicin and weight loss, however, because these studies have not looked at capsaicin in isolation, explains the University of Maryland Medical Center. Hot peppers are good sources of antioxidants and vitamins A and C, so adding some spice to your cooking still has benefits. Always talk to your doctor before using capsaicin or any other herbal treatment. Some people experience heartburn or stomach irritation when taking capsaicin supplements or eating hot peppers. Test topical ointments containing capsaicin on a small area of skin to check for irritation, and don't use it with a heating pad or apply it immediately after a hot shower.